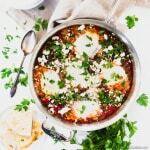 The idea of pairing shakshuka with feta cheese may not be especially groundbreaking, but the way I make it will either impress you or horrify you, depending on how much of a shakshuka purist you are. But even the purists among you won't be disappointed once you take a bite. I promise it is worth relaxing your definition of shakshuka for this hearty, healthy, and satisfying one-pan dish! Heat oil in a large cast iron skillet (or other type of heavy pan). Sweat the garlic and onion over medium heat, until softened and translucent. Add the artichoke hearts, spinach, and red pepper to the pan. Saute briefly, then add the tomatoes, salt, pepper, and chili powder. Cover and cook until the red pepper is tender. Taste and adjust seasonings to your preference. Press the back of a tablespoon into the tomato mixture to create 5-6 little wells. Crack eggs into the wells (one into each), then re-cover the pan and cook just until the egg whites are firm. Uncover, remove pan from heat, and sprinkle crumbled feta cheese and chopped parsley over the top. Serve immediately with flatbread or pita cut into wedges. Your artichoke hearts should be cooked before you add them to the pan. Don't hesitate to use the kind in a can or jar, but make sure you've thoroughly drained and rinsed them before adding them to the pan. If using frozen spinach, defrost and thoroughly drain it before adding to the pan. 28 ounces crushed tomatoes is equivalent to one large can. Double check to ensure your tomatoes do not contain added salt, herbs, flavors, or other additives. Some sources claim that cayenne is the more "authentic" spice to use in shakshuka, so feel free to use it in place of chili powder, if you feel strongly! Make this dish Whole30 compliant by omitting the cheese and the flatbread.